Here at Peter Newman Flooring we are flagship stockist of Alternative Flooring showcasing their full range of flooring. To view our full range of Alternative carpet flooring visit Peter Newman Flooring in Poole where our team of flooring experts will be able to offer their advice and support as well as provide you with samples of Alternative Flooring. Alternative Flooring is a design-led flooring company with over 20 years of experience producing calm, character and quirky luxury carpets. Their designs have been break new ground, rules and silence in homes across the UK for two decades. Natural – The natural range takes inspiration from a range of textures that add depth, interest and richness to an interior. All of the carpets in the natural range are derived from sustainable natural resources from around the world. Wool - Fine and chunky wools that are full of natural character and texture. A wool rich carpet is as warm and welcoming as an open fire. Adding sophisticated and luxurious wool carpets are naturally soft and comfortable underfoot. As well as luxurious comfort our wool carpets will help to baffle out sound. 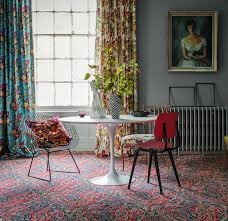 Quirky - If your after beautiful patterns aimed at bringing your living space to life then the Alternative Flooring range of kooky and fun, Quirky collection is for you. Our quirky collection includes a range of collaborations with some of Britain’s top designers including Margo Selby, Ashley Hicks and Liberty Fabrics. Barefoot - Ethically and environmentally friendly, the Barefoot range is the ultimate understated 100% natural wool. The Barefoot collection is the first unique, bio-degradable carpet launched in the UK. Runners - A sample of our stunning carpet range offered as runners; ideal for staircases and offer a cost-effective and more economic choice for narrow areas. Here at Peter Newman Flooring we are able to fit and install your new Alternative Flooring. Our flooring installation service starts with a free no obligation quote which includes full measuring, planning, and design service. Once the quote and plan has been agreed we can get underway with installing your new Alternative Flooring. All our work is carried out by our in-house team of highly skilled fitters and is warranted for at least 12 months. We tailor our fitting service to suit your individual requirements and all our craftsmen are awarded with CSCS and NVQ qualifications. After your new Alternative Flooring carpet has been installed we offer an after sales services which includes a care and maintenance pack, applicable to the products installed. Additionally, we ensure we comply with all manufacturer’s product guarantees and warranties, and we are also backed by the Carpet Foundation and Office of Fair Trading. If you have decided that Alternative Flooring is what you’re looking for then visit Peter Newman Flooring’s showroom in Poole today to view the full range of Alternative Flooring and collect samples of your favourite carpets. Once you’ve decided on the one Peter Newman Flooring can take care of the rest. Simply call us today on 01202 672222 today to find out more about Alternative Flooring and our flooring installation service.